Yeah, yeah, I know, theses have been done to death. Sorry, but it's a first for me. Seeds fall essentially straight down when dropped without a breeze, so I tilted my set up to give the appearance that it is being carried away by a breeze. Finally realized that some fall more slowly than others. Once I found a good one, took numerous shots with it. Nice having a camera and flash that can sync at high shutter speeds to substantially capture motion of dropped seed. POST: Thanks for all the comments (even yours, Eric)! This did much better than I had expected. Why is it that entries I expect to score well do poorly and ones I expect to score poorly do well? Congratulations on your high placement, love the lighting in this shot. When I do mimic something, I TRY to make some element(s) of it unique or at least execute it better than has been done before, as I'd like to think I have done in my entry this week, and as you have in yours. Well, you didn't. It scored in the top 5 because this is DPC. Your lighting is off and nothing is original. If you can't handle honest critiques on your images, perhaps a public challenge forum isn't for you. Your retaliation was very, very unnecessary. Message edited by author 2009-09-23 17:17:32. I love how the lower looks on, as if saying farewell to its offspring :-)) Really well done. Nice job, congrats on 4th. This will be in the top 3 I bet. Great image. Perfect. Wow. One of the best ive seen on DPC to be honest. 10 easily. Great shot.. love the lighting and setup! A definite 10 in my opinion. Job well done. Love the lighting. Colors are a bit pixilated. Nice use of lighting and it has an anthropomorphic feel to it - kind of reminds me of a mother watching one of her kids leave the nest. Good one. Like the details and sharpness. I like the composition and the minimalistic image you have presented here, but the subject matter suffers from commonality here on DPC. 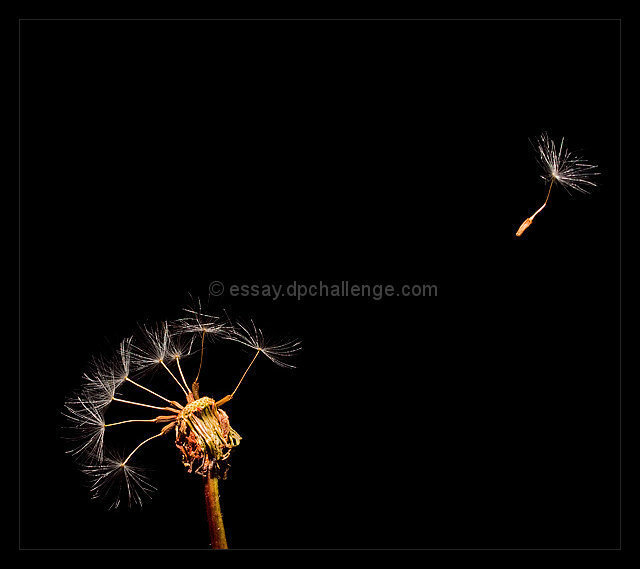 There are a lot of dandelions on DPC. In fact, I think I've even seen a few with the same type of blown technique. Something seems off to me with the lighting. The highlights seem a little too harsh. 5. Proudly hosted by Sargasso Networks. Current Server Time: 04/22/2019 06:35:24 PM EDT.